One of our favorite restaurants here in Portland is the Habibi Restaurant downtown on Morrison. They share generational recipes featuring their Syrian and Lebanese ancestry. Delicious food. We bring all of our out of town guests (that’s 2 so far) to this spot. My most favorite thing to get there besides the vegetarian mezza platter is their tabouli salad. Did you know there are a million ways to spell tabouli? 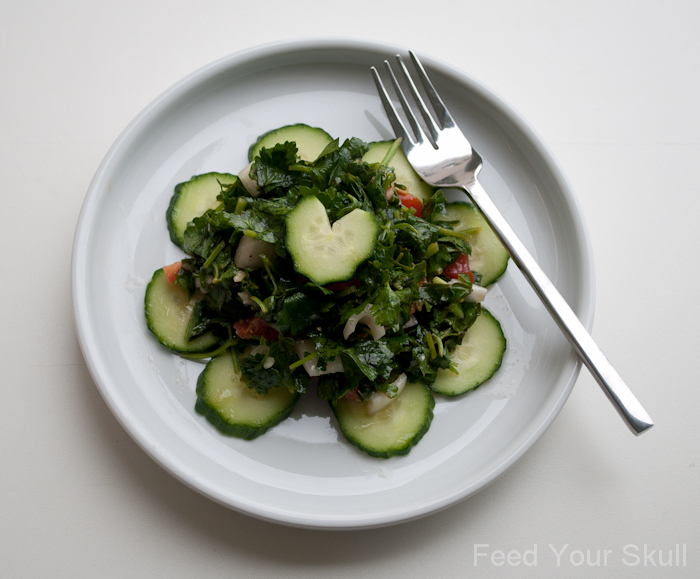 Other correct forms are tabbouleh, tabouleh, or tabbouli – okay so at least 4 ways. Habibi’s version of this salad has the teensiest bit of bulgur in it but, in my tribute I left that out. In the future, I think I’ll add sprouted or even cooked quinoa, not a lot, just enough to give it a little color and texture. Their salad is so good that I have a hard time deciding between the full on mezza platter or this salad. The mezza has a portion of this salad, but it never seems like enough! Because we reasonably can’t eat there every day, this is my tribute to their deliciousness. The big trick, I think, is to letting it marinate overnight. That time allows the acids from the lemon juice and tomato along with the oil to really soften the parsley’s hearty leaves. Now, there are two types of parsley Italian flat leaf and curly parsley. Feel good choosing either one, they will both be delicious! I love putting this detoxifying herb in smoothies and making them a star in their very own salad. 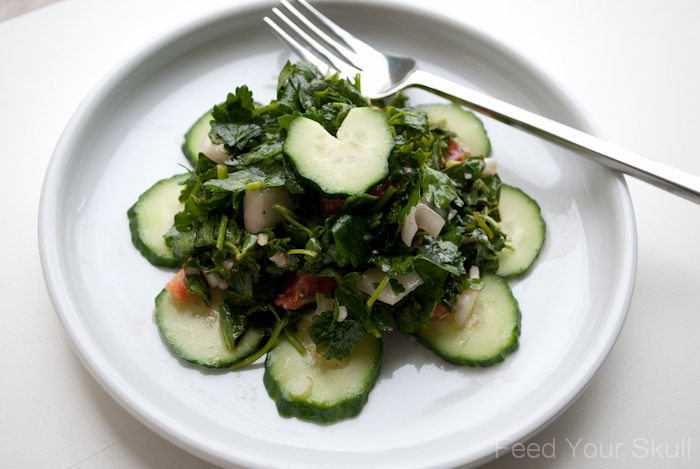 Like this Toasted Sesame Parsley Salad. Add ingredients to a large bowl and mix to coat. Cover and store in the fridge overnight or at least 8-12 hours. What is your favorite salad when eating out?? Michelle, this looks great but I am not a parsley fan. I do love spinach salad with bacon, boiled eggs, and onions made right in my very own kitchen. It’s easy and served with garlic bread, is a meal. Our family of 4 eats a pound of spinach when eating this salad. Go easy on the bacon and it’s super healthy, too. Great pictures – as always.